The Battle Between SMS and Social Media Recruiting: Who’s Winning? - Send and Receive Automated Call and SMS Text Campaigns. The Battle Between SMS and Social Media Recruiting: Who’s Winning? Recruiters and companies are keeping up with trends in using social recruitment and SMS blast to achieve their business objectives, particularly, in finding the right talents that they should hire. More than 90% of recruiters go to social channels to search for and recruit candidates, while about 60% of recruitment agencies reach out to job seekers via text messaging. This data only shows that SMS and social media are widely used as recruiting tools in job markets where technology is advancing at a fast pace such as the Philippines. In fact, the BPO sector is one of those that are adopting SMS messaging to communicate job opportunities to potential employees. Recruiting Through SMS and Social: Which Should You Choose? SMS and social are battling it out as modern-day recruitment tools, but which one has the edge? Here’s how they stack up against one another in various aspects of recruitment. Through social media, you can review the profile of your candidates and identify their skills, interests, or viewpoints based on the things they share on their social account. Social media recruiting is also one way to pre-qualify candidates, including their ability to communicate their thoughts or ideas and whether they’re actively or passively looking for a job. Similarly, if you leverage SMS recruiting, you could pre-screen candidates for their communication skills and have a feel if they are fit for the job. 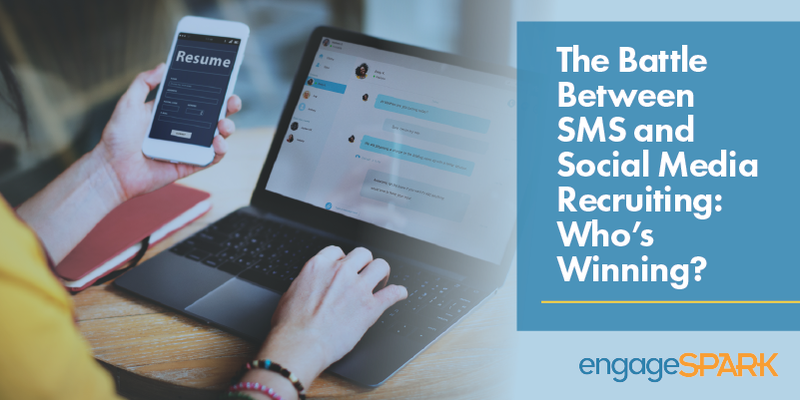 All in all, there’s combined power in SMS and social media recruitment when it comes to determining a candidate’s readiness, motivation, or chance of success in your organization. SMS recruiting platforms offer affordable plans that you could customize and integrate into your own hiring system or software. Thus, you can save a lot of money and time sending out a text message to multiple candidates and allocate the rest for other things. Since text messages have a 94% open rate, you could reach more candidates, too. Social media is equally cost-effective since you could choose between setting up a free account and posting paid job advertisements on either Facebook or Twitter. Even if you go for paid recruitment ads on social, you will find that the rates are more affordable compared with how much job fairs or newspaper ads might charge you. Mobile and social users spend a lot of their time checking their phones and social accounts every day. Thus, it’s very convenient for you to send job alerts and updates to potential employees, as you could expect an immediate response, which is helpful in speeding up your overall hiring process. There’s no better way of engaging today’s breed of workers than making yourself available on their preferred channels of communication and interaction. They warm up better to people or businesses who are trying to connect with them on that level. In the 2018 State of HR in the Philippines report, Facebook and LinkedIn are the top choice of tools of social recruiters, and that only 9.3% of recruiters don’t use social media in hiring. That said, you could beef up your social recruitment efforts more. SMS is another widely used platform, which you could tap for your recruitment efforts. With the number of mobile phone users increasing year-on-year, you’ll be reaching a large portion of the workforce directly on their cellphone. Overall, SMS and social recruiting are helpful in improving your competitive advantage as a recruiter who provides a personalized and positive candidate experience. When you use social and text messaging as recruiting tools, you’re providing equal opportunities to both online and offline candidates to fill positions in your organization. Since you have a bigger and a more diverse talent pool, it’s easier for you to find someone who’s a good match for a job role. Summing up, you could get outstanding results in your hiring efforts by using both SMS and social media. Instead of relying on a single tool in recruiting, you could take advantage of an omnichannel mobile engagement platform to find, attract, and retain the right people for your organization.